Delta Force Paintball South London: Featuring Space Warz! Delta Force Paintball South London offers customers two paintball centres in nearby Effingham, Surrey. 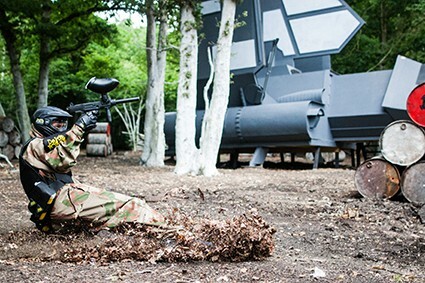 Both centres are just off the M25 at Junction 10 and are positioned only a few miles apart – perfect for paintball fanatics living in South London. And with our paintball centres catering to players aged 8 years and up, it’s an adventure activity that the whole family can enjoy! Our Surrey Paintball centre is nestled in the beautiful Surrey countryside and has just received a £40,000 refurbishment in addition to the introduction of a brand new game zone – Space Warz! Based on a cult-classic film-series, the new game zone at our Surrey Paintball centre has already been a huge hit! In addition to this intergalactic game zone, our flagship centre offers game zones such as Tomb Raider featuring a giant stone pyramid surrounded by Easter Island statues, London Town which is home to several original London double-decker buses and taxis and a replica Houses of Parliament, Castle Wallenberg which features a huge two-storey castle with sniper towers and Viet Cong Village featuring various thatched huts and a central sniper tower. Smoke grenades, paint grenades and MK5 Thunderflashes are also available for customers over 18 years to use; these added extras can make all the difference between winning and losing! Another key feature at our Surrey paintball centre is the crashed Alvis Stalwart heavy-duty amphibious military truck which takes prime position, right at the front entrance and visible from the main road. 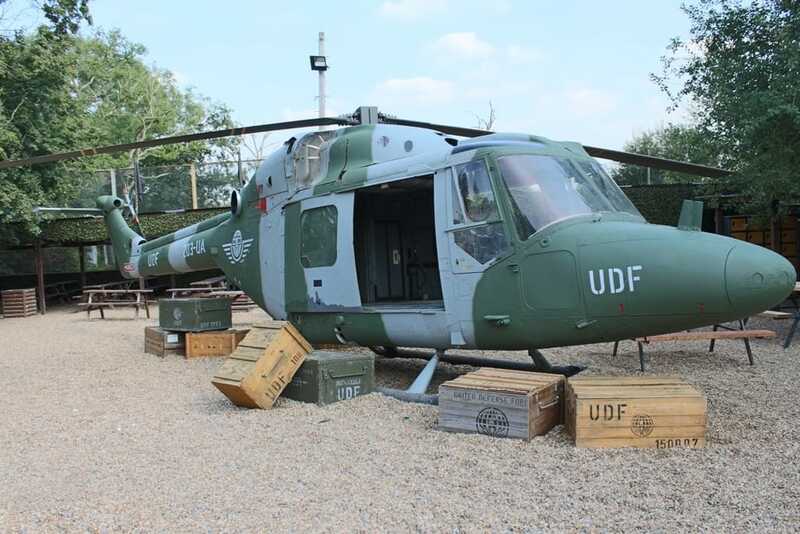 To complete the wow factor at Delta Force Paintball Surrey there’s also a helicopter that was used in Tom Cruise’s film – Edge of Tomorrow. Our South West London Paintball centre is another popular paintball venue in South London located just minutes away from the Surrey Paintball centre. The South West London centre has 7 exciting games on offer, the key game zones are: Zombies’ Crypt which has haunted church surounded by creepy tombstones, Viet Cong Village which is home to lots of seemingly abandoned village huts and London Apocalypse with two-storey London buses. With so much to choose from, we can guarantee there’s a game zone at Delta Force Paintball in South London to suit everyone’s tastes!